Simply put, this is the trip of a lifetime. Our goal is the highest peak on the Antarctic continent, The Vinson Massif (16,067'). Mount Vinson requires a solid mountaineering background and a true spirit of adventure. Technical difficulties are not great, but the extremes of this environment require team members to have reasonable crampon, rope travel and ice axe experience. Prior time spent in cold weather camping and carrying loads is also required. As equipment for this expedition is extremely important, one full day will be spent in Punta Arenas doing equipment checks prior to our flight to the White Continent. IMG has been conducting trips to Vinson since 1988. Very few guide services have that length of Antarctic experience. Over the last 30 years, IMG has never missed the summit of Mount Vinson, we think that's a pretty good track record. We fly to Punta Arenas, Chile where the trip begins. From here, we fly in a chartered Russian jet to the Union Glacier camp at 80 degrees south latitude. IMG contracts with Antarctic Logistics & Expeditions for this flight and all our logistics in Antarctica. We then fly in a ski-equipped twin-engine Otter to Vinson Base Camp at 79 degrees south latitude. Vinson Base Camp is located approx. 660 miles from the South Pole; the pilots are Antarctic experts. The trip will take a minimum of 16 days (weather permitting) and will be open to only six experienced climbers. Two camps will be established above base camp by making a carry to the new camp prior to moving higher. The climbing will consist of extensive cramponing on moderately steep slopes. The ability to camp and take care of yourself in extreme conditions is very important. Temperatures can drop to minus 40°. You can think of Vinson as a short Denali climb. Antarctica is an amazing place. It's as close as you will ever get to another planet without leaving this one. 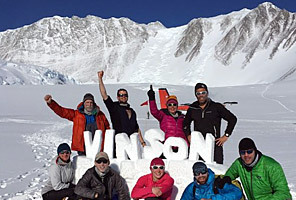 Vinson is one of the most unique of the Seven Summits adventures. We hope you will seriously consider joining us on a trip to the Ice.